All Conservation Sites are intended for public enjoyment and recreation. Home to Common Lizards, Adders, Grass Snakes and Slow Worms, Hazleton Common is our largest site and consists of 40 acres of lowland heathland with copses. The sun brings out the dragonflies too so check out the pond area for Broad -Bodied Chaser and Emperor species. On your travels round listen out for a Stonechat, a small bird which makes its home amongst the gorse, its call sounds like two pebbles tapped together. Look out for other bird species such as Green Woodpeckers, Kestrels, Sparrowhawks and occasionally Partridge. Hazleton Common also has a diverse range of native flowers growing on it, including Heather. 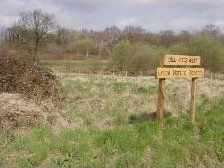 How to find it: Hazleton Common Local Nature Reserve is located between the A3(M) and Hazleton housing estate. It follows the motorway south where it joins Waterlooville Golf Course and the Havant Borough boundary. Main access points: There are entrances at Hillview and Hollybank Close (both accessible from Greenfield Crescent). Access can also be gained along the bridleway running south from the Hazleton interchange. 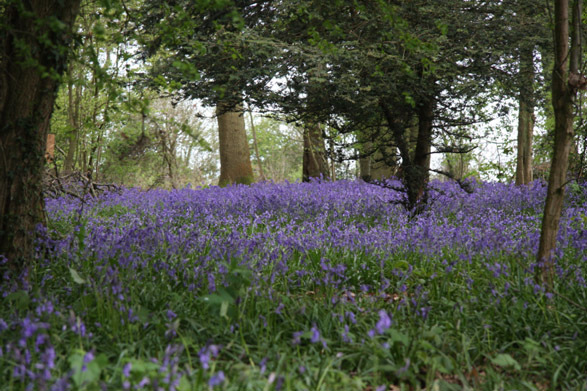 The 12 acre copse is a very important fragment of semi-natural ancient woodland. There has been permanent woodland on this site for over a thousand years. Look out for some of the more unusual woodland flowers like common cow wheat with its long, thin, lipped yellow flowers or butcher's broom, a spiky bright green plant, so called because it was once used to clean the butcher's block. 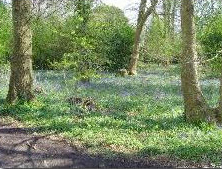 The copse is also home to many rare species of tree and it is inhabited by a huge range of animals. How to find it: The copse lies to the south of Horndean Parish between Yoell's Lane and Coldhill Lane. Main access points: Main entrance point on Loxwood Road off Yoell's Lane. We have been busy at the 3 acre field recreating a flower rich meadow, laying hedges and planting trees to make a much better home for wildlife and a much nicer place for humans. The oxeye daisy gives a fine display, but other plants like yellow rattle can be seen as well as Birds Foot Trefoil, also known as 'eggs and bacon' because of the colours in its flowers. 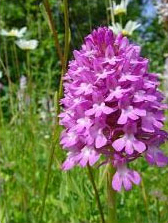 Common Spotted Orchids can also be found. Butterfly species such as Common Blue and Holly Blue as well as many grassland specialists such as grasshoppers are found here. How to find it: Parsonage Field has its own car park opposite Catherington Infant School, Catherington lane. Main access points: From the car park or by footpath from Catherington Down. A 30 acre ancient woodland with some wartime tales. During the second world war the Lith was used as evacuation plots for people from Portsmouth. The Lith also has remnants of chalk grassland and is home, each year in May, to The Living Woodland Fair. How to find it: Catherington Lith LNR is located between the A3(M) and Catherington Lane. Main access points: You can get into the reserve from Lith Lane (straight up the hill by the motorway bridge on the London Road) and from Mundays Row or Down Road. The Lith is well served by public footpaths leading from The Farmer Inn, Catherington, All Saints Church, Catherington ad Five Heads Road. The place where amazing beasts can be plucked from the depths to be studied and photographed. The pond is home to almost 30 species of invertebrate including dragonfly larvae and some magnificent water beetles. Species of newt as well as frogs can also be found. What's more using dipping nets from the purpose built platforms couldn't be easier. Find out more about pond life at Catherington at our annual Hi-Tech Wild Trek event. 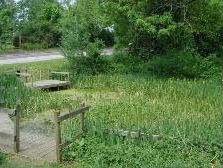 How to find it: Catherington Pond is located next to Catherington Infant School on Catherington Lane. Our very own peaceful wildlife garden. Another good site for butterflies with Holly Blue and Orange Tip making apearances. St Giles has a developing wild flower region and several large trees including one ancient Yew tree. How to find it: St Giles Churchyard is located at the top of Blendworth Lane, to the right of its junction with Duckstile Lane. Catherington Down is designated as a Site of Special Scientific Interest. It covers 32 acres and consists of chalk grassland with remnants of ancient semi-natural woodland. It is a very popular site due to the high concentration of rare wild flowers such as Round-Headed Rampion, Pyramidal Orchid and Wild Thyme. It is an important site for many insects and also has a healthy population of birds. Species including the Yellowhammer, Buzzard and Barn Owl can be seen. Mammal species including the Stoat have also been recorded. How to find it: Catherington Down is situated west of Parsonage Field and east of Lovedean Lane. Main access points: Access is possible from Catherington car park via Parsonage field and also available from three lay-by's in Lovedean Lane. 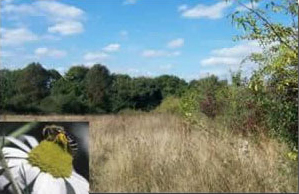 Dell Piece West covers 16 acres and is a developing mix of open grassland and mire with fragments of woodland. 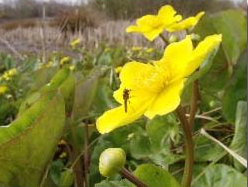 Wildflower species that can be found include, Southern Marsh Orchid, Common Fleabane, Marsh Marigold and Water Mint. Mire habitats are rare and so this naturally wet site has some uncommon features to be appreciated. How to find it: Off Lakesmere road, opposite Morrison's supermarket. Main access points: The Monarch Way, the longest footpath in England, passes directly past Dell Piece on the eastern edge. Access gates available on Lakesemere Road and Portsmouth Road. The South Downs has been nationally recognised for its natural beauty and the space it offers for people to enjoy the countryside. This is why it has been made into a National Park. Grassland sites which are being managed for nature conservation often benefit from grazing during autumn months. This helps to create suitable conditions for the beginning of the growing season next year and will improve conditions for the growth of wild flowers. Horndean Parish Council asks visitors to our nature reserves to bear in mind that cattle are usually very timid creatures and will not cause any harm. However, dogs should be closely monitored in the presence of cattle, especially if they are known to be excitable. We also ask visitors to kindly use the dog bins which are provided, as allowing a dog to fowl on public land and discarding it is against the law, under the Environment Protection Act 1990. Nutrient enrichment from dog excrement could also potentially damage the ecology of sites like Catherington Down, that depend on nutrient-poor soils.